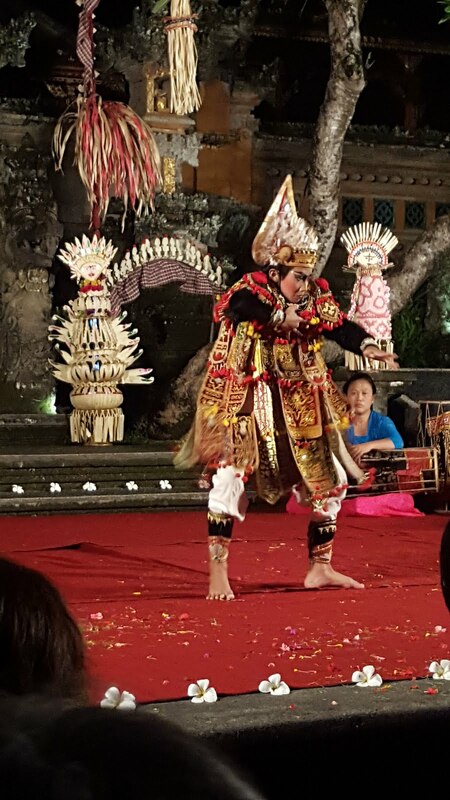 You know I have lots of stories to tell you about my holiday in Bali. Did I ever told you that I spent 14 days in Bali? Oh yeah, 14 amazing days to spent in Bali. 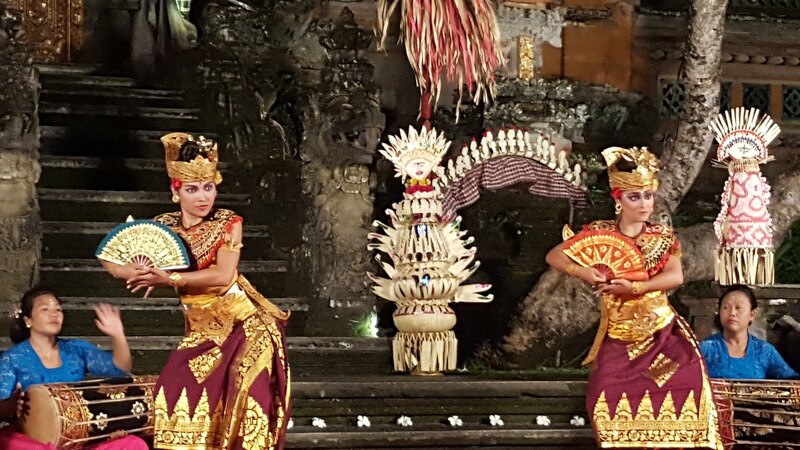 After telling you about my visit to two museums at Ubud, and Visiting the Monkey Forest, still at Ubud, and the only things that you can miss is to watch their traditional dance. After one early morning my boyfriend and I can't go anywhere because rain in Ubud, and just spent all day at the balcony enjoying the rain, scenery (our hotel right in front of the traditional rice field) and playing with our own game at handphone, the rain then stop around 4pm. And we decided to go to the Ubud center, by using our hotel vehicle. Our hotel named Gita Maha Hotel, a two star hotel with superb scenery and services. They provide you a transport, but just only at Ubud Center, but, you can asked them to take you somewhere (if you are lucky enough), but they will be willing to take you everywhere you want to go around the Ubud center. If you follow their schedule, you will have free transport, but outside the schedule, you will pay around Rp.50.000 for one take. Our vehicle stopped at usual place, the Puri Saren, or you can call it Ubud Palace. 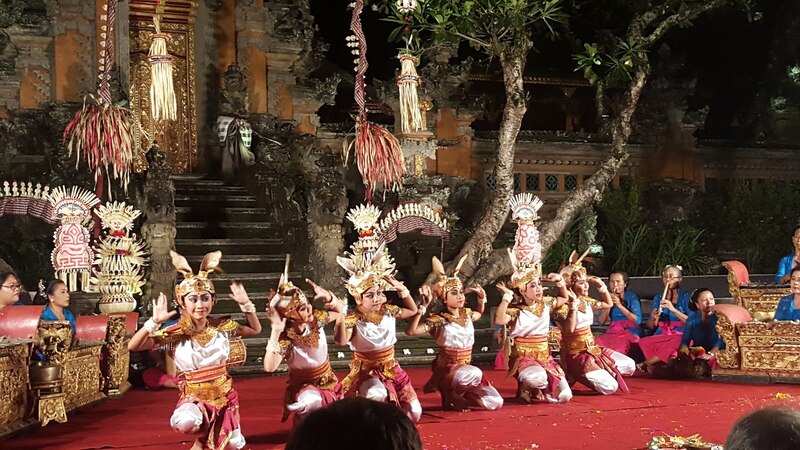 It's like a palace for all the family of the Ubud King. You can come inside, and look around but yeah, some places is forbid to get inside. It's 6pm when we arrived at the Ubud Palace. For looking the dances, it's not soooo difficult. Especially for you (like us) who didn't use the tour guide. 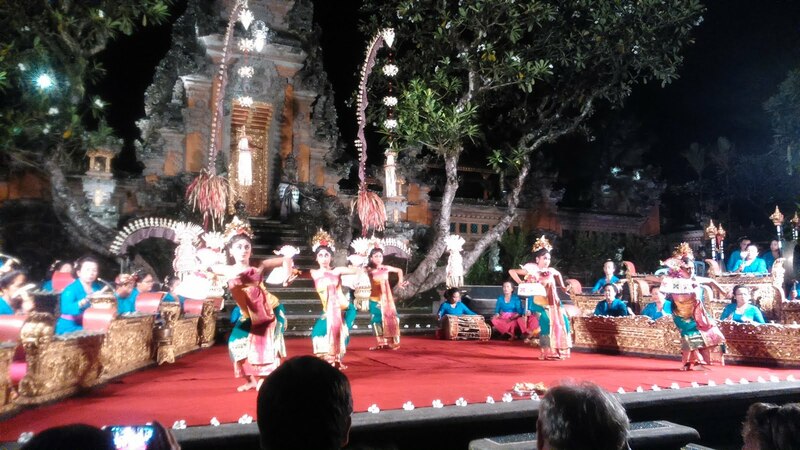 Just came into the Ubud palace, and you will find lots of people try to offer you a ticket to see the dances. The wonderful thing is, you can choose in which place you want to watch the dance. I count there are three places that show the dance, the Saraswati Temple, The Ubud Palace, and at the hall. You just came to those people who over you to watch the dance. 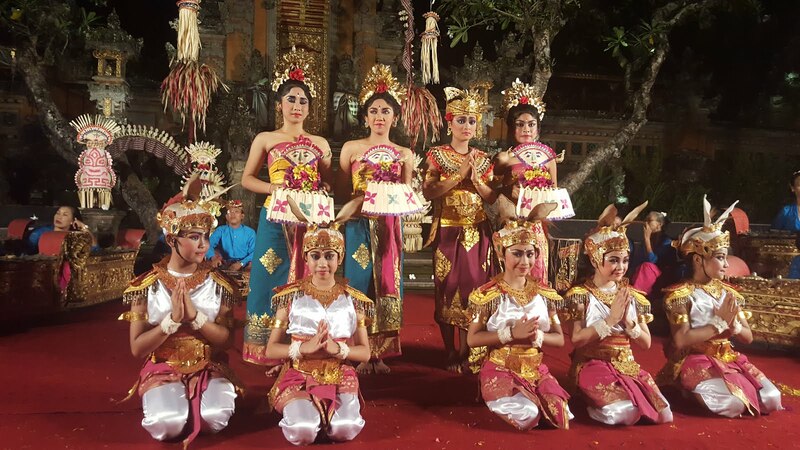 They used to be stand around the Ubud Palace, or even some places too. 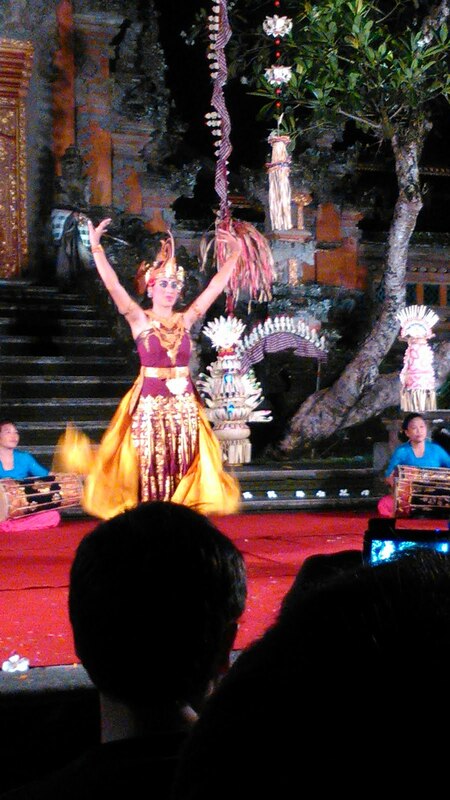 When we arrived at the Ubud Palace, this young lady immediately offer us to watch the dance at the Ubud Palace. Since I don't know what dance is which, we just want to watch the dance at the Saraswati Temple. Don't worry about that, even we came at the Ubud Palace, but want to watch the dance in the different place, the young lady is trusted, she one of the member Ubud tourism official dance ticket seller. So, my boyfriend asked me "is this the dance you want to watch?" Honestly, I don't know, ha ha ha... 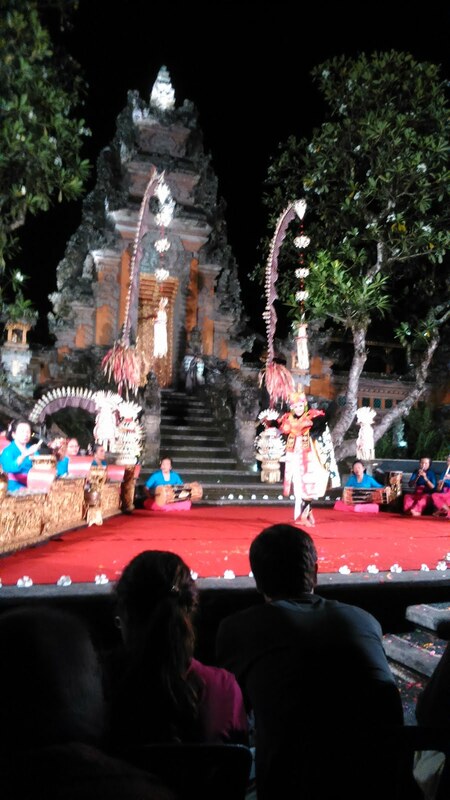 I just said I want to watch the dance at the Saraswati Temple, the temple near the Lotus Resto and Starbucks. Why? 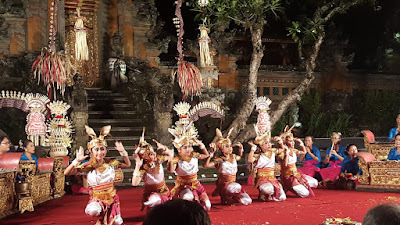 Because, when we came for the first time to Ubud, our driver, which is friend of my friend, told me that almos every night they have traditional Bali dance. 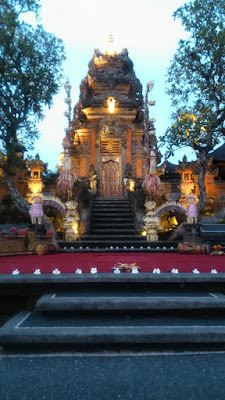 And he said the most interesting is, in the Saraswati Temple, because it's near the starbucks, and he said you can watch inside the temple, or just watch it from starbucks. So I have two choices which is both are interesting, I like starbucks, and possibly I will watch it from starbucks, free (just bought a cup of coffee and enjoy from there), or just bought the ticket for two of us and watch it inside the temple. So I said, I want to watch the dance in Saraswati Temple, and the lady handed us two tickets of dance show in Saraswati Temple. Is it expensive? Surprisingly it isn't. We just have to pay Rp80.000 for each ticket. The lady gave us the tickets, and told us that the dance will be held at 8pm. We arrived at the Saraswati Temple 15 minutes after, it's about 1 hour and 45 minutes earliear. And yes, the temple is outdoor. The beautiful thing from this temple is, once you came inside it, until you reach the chair for watch the dance, you have to cross the path that cross the lotus pond. B.E.A.U.T.I.F.U.L!!! Since the show is outdoor, and near the pond, don't forget to bring mosquito repellent, lots of bugs and mosquitos flying around you. And we were lucky that night, because the show was performed by a woman group, means all the dancer and the music players are women. There are five dances in that night performance. Too bad I throws the paper that telling the stories of all the dances. Second one was two girl dancer, and it called the peacock dance. (I remember this dance name). These two girls dancing gracefully with their peacock look alike costume. Third dance is a single dance, I forget the name, but I remember the dance is about a leader that think about how to lead his people and the war strategic, very tense. Fifth dance is called the rabbit dance. You can see 6 or more (I forget) young dancer came and have a costume like a rabbit. Of course you know what kind of dance it is. The last dance... I also forget the name, it more like a human pantomime. Because this dancer dance and suddenly came to the us, and doing some movement that looks like having communication with us. Pretty good. Another awesome post baby. I hope others enjoy it like I do. Thank you love... glad you enjoy it..